Beep” is not a sound you expect to hear coming from a hummingbird feeder. Yet “beeps” abounded during a study led by the University of California, Davis to monitor hummingbirds around urban feeders and help answer questions about their behavior and health. For the study, published today in the journal PLOS ONE, veterinary researchers tagged 230 Anna’s and Allen’s hummingbirds with passive integrated transponder (PIT) tags and recorded their visits to feeders equipped with radio-frequency identification (RFID) transceivers. This is the same technology animal rescue shelters use when placing microchips under the skin of cats and dogs so they can be tracked if lost. Before she was tagging hummingbirds, Bandivadekar was radio collaring tigers to monitor their movements at a national park in India. 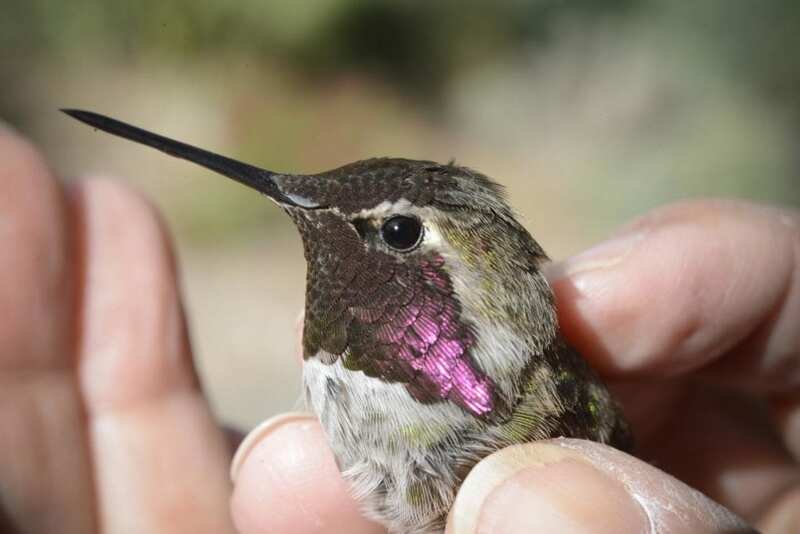 The collar itself weighed about 5 pounds, whereas a hummingbird’s entire body is about 5 grams, the weight of a nickel.